Fig. 1.5. Electron micrograph of a node of Ranvier in a single fibre dissected from a frog nerve. Reproduced by courtesy of Professor R. Stampfli. Fig. 1.6. Schematic diagram of the structure of a vertebrate myelinated nerve fibre. The distance between neighbouring nodes is actually about 40 times greater relative to the fibre diameter than is shown here. and supporting tissue. It also accounts for the difference between the white and grey rami of the autonomic system, containing respectively small myelinated nerve fibres and non-myelinated fibres. At the node of Ranvier, the closely packed layers of Schwann cell terminate on either side as a series of small tongues of cytoplasm (Fig. 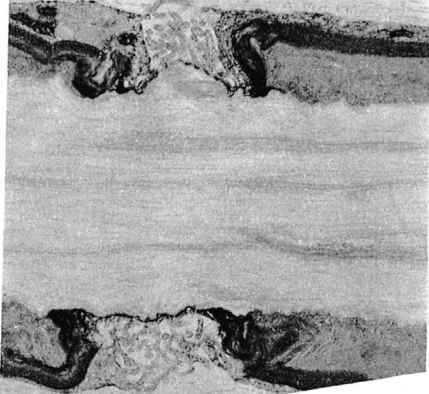 1.7), leaving a gap about 1 fxm in width where there is no obstacle between the axon membrane and the extra-cellular fluid. The external electrical resistance between neighbouring nodes of Ranvier is therefore relatively low, whereas the resistance between any two points on the internodal stretch of membrane is high because of the insulating effect of the myelin. The difference between the nodes and internodes in accessibility to the external medium is the basis for the saltatory mechanism of conduction in myelinated fibres (see p. 75), which enables them to conduct impulses some 50 times faster than a non-myelinated fibre of the same overall diameter. Nerves may branch many times before terminating, and the branches always arise at nodes. Fig. 1.7. Drawing of a node of Ranvier made from an electron micrograph. 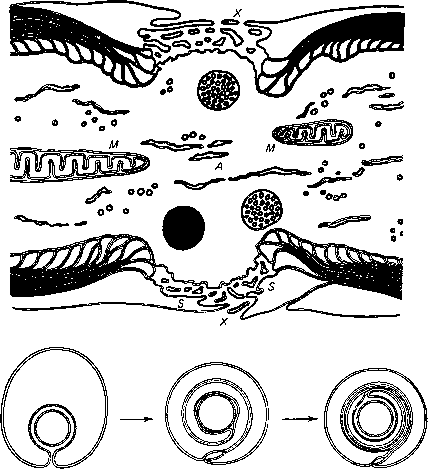 The axis cylinder A is continuous through the node; the axoplasm contains mitochondria (M) and other organelles. 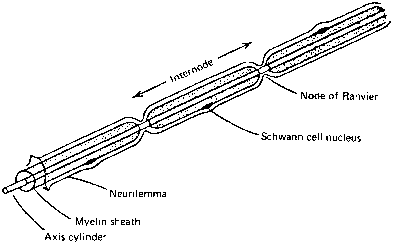 The myelin sheath, laid down as shown below by repeated envelopment of the axon by the Schwann cell on either side of the node, is discontinuous, leaving a narrow gap X where the excitable membrane is accessible to the outside. Small tongues of Schwann cell cytoplasm (S) project into the gap but do not close it entirely. From Robertson (1960). bundles which in turn form a whole nerve trunk are surrounded by the epineurium. 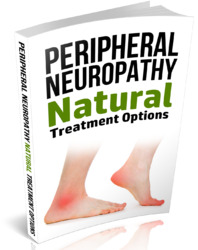 The connective tissue sheaths in which the bundles of nerve fibres are wrapped also contain continuous sheets of cells which prevent extracellular ions in the spaces between the fibres from mixing freely with those outside the nerve trunk. The barrier to free diffusion offered by the sheath is probably responsible for some of the experimental discrepancies between the behaviour of fibres in an intact nerve and that of isolated single nerve fibres. 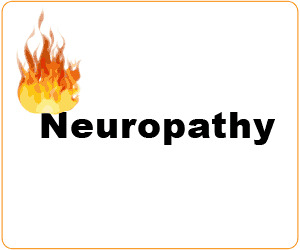 The nerve fibres within the brain and spinal cord are packed together very closely, and are usually said to lack a neurilemma. The individual fibres are difficult to tease apart, and the nodes of Ranvier are less easily demonstrated than in peripheral nerves by such histological techniques as staining with silver nitrate.